The 17-foot Boston Whaler Montauk, shown here in the water, turned heads at Whaler’s 2017 Yacht Expo in Florida. The boat was displayed on a trailer near the biggest yachts the Brunswick Boat Group makes. 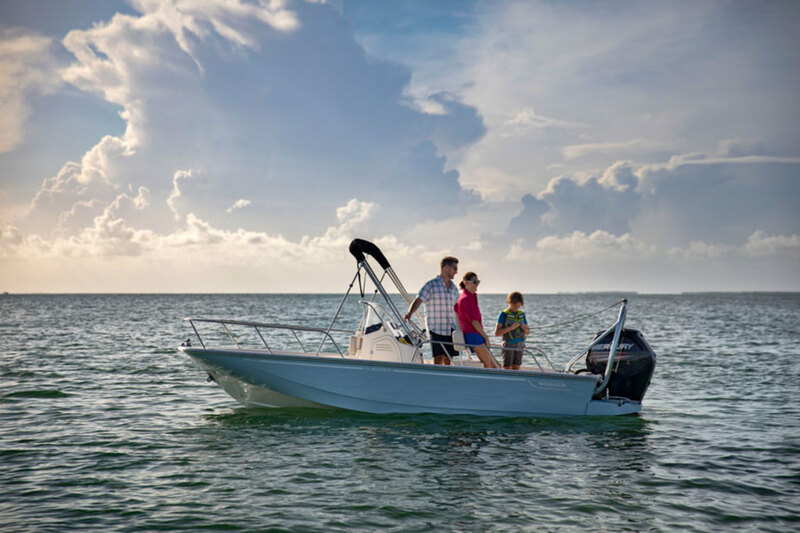 CAPTIVA, Fla. — Boston Whaler marked its 60th anniversary during its Yacht Expo last weekend and media event, which wrapped up on Monday — one reason the company redesigned its iconic 17-foot Montauk for model year 2018. Anyone of a certain age will remember the boat as “the unsinkable legend” that got sawed in half and sent floating down waterways in 1958; the 2018 version was perched on a trailer alongside most of the largest Sea Ray models and bigger Whalers, including the 420 Outrage, which awaited sea trials at the South Seas Island Resort marina on the Florida island. Although it was trailered and dwarfed by nearby boats, The 170 Montauk was not overshadowed. Eric Moilanen, a 345 Boston Whaler Conquest owner, did not expect to walk into the event and scoop up a 17-foot boat to add to his fleet. But the boat brought back childhood memories and aspirations that he hadn’t expected. When the Detroit-area native was 12 years old, he saved up to buy a 13-foot Montauk, circa 1976. At that time his “definition of success” was to own a 17-foot Montauk, he told Trade Only Today. Though he’s the owner of a 345 Conquest and has had five Whalers and two Sea Rays, Moilanen has never owned a 17-foot Montauk. So when he entered the Yacht Expo and saw it there — redesigned with a modern hull and several new features — he impulsively bought the boat. “This is timeless, iconic, legendary,” Brunswick Boat Group president Huw Bower said Saturday morning during the event. “It lets people see this is what Whaler could be,” Bower said, gesturing toward the 420 Outrage, “but this is what most of the industry is,” he said, gesturing toward the Montauk on a trailer. One of the things about the Montauk that Boston Whaler knows is that people will own and run them forever. So the company went around the country for a month asking people how they used their boat and what they liked about it — as well as what they didn’t. But what the company learned was that the way people used these boats varied greatly by region. That led Whaler to offer options that would allow them to sort of customize their boat — from rail positioning to an optional fishing package — to where they lived. Other regional preferences, such as space for crab pots in the Northwest, had to be designed in for good. The Montauk is a bit larger now and has a bit wider beam. The fuel tank being below the floor frees space for crab pots or whatever else, and a 115-hp outboard replaces the 90 for a bit of extra speed. Here’s a video of Moilanen talking about his experience — we’re sorry for the less than awesome late-night A/V, but the story is worth it.